The Portuguese Watchdog, also called the Rafeiro do Alentejo is conformity to the physical type, temperament and movements are basic factors to take into account. The head has a broad, rounded skull, proportional to the body. Eyes are dark and very characteristically expressive. Ears are small to medium-sized, triangular, with rounded tips placed halfway along the skull, bending at the base and dangling. Its silhouette is slightly convex; males are bigger and have a bulkier head than females. The neck is short and strong, with a regular dewlap, the trunk is robust, bulky and muscular, the chest broad and deep. It has strong, upright limbs in both front and rear. The tail is long and curving, on a line with the rump and falling underneath and between the hocks; when in action it may curl up. Hair is of medium length, thick, straight and dense. Hair color can be black, wolf like, tawny or yellowish, in a fair, striped or white-spotted pattern. The Rafeiro do Alentejo is an excellent, safe and self-confident guard dog that is particularly alert at night. It's not a dog for beginners; it needs a handler who naturally radiates leadership. Calm, steadfast, and brave, but not aggressive. Independent, very watchful and self-assured. Affectionate with its own family, but suspicious of strangers, especially after dark. This dog can be stubborn and dominant. When training the Rafeiro do Alentejo, the best results are achieved by motivational training methods with a determined, consistent and loving approach. It is very important to begin training as early as possible, because a fully grown dog may be too strong and too big to be corrected and because this dog has his own ideas and will not cater to his owner's every whim. This breed is sensitive to reprimands and eager to receive affection. They will generally get along with other animals provided they have been introduced to them when they are still young. It is important to socialize them while they are still young. These dogs mature quite slowly, reaching full adulthood at about four years old. They guard, but do not herd, livestock. They do not eat much for their size. Extensive early socialization, obedience training and consistent dominant leadership are very important when owning a Rafeiro do Alentejo. This is not the kind of dog to learn useless tricks; they usually want to keep their energy for the real work. Do not allow the Rafeiro do Alentejo to over exert itself with activities such as jumping, running and going up and down stairs, when it is a puppy. The reason is it needs to save time and energy to develop healthy bones, muscles and tendons. With its highly noble character, it is tough to strangers but docile with children. Undoubtedly a dog more for defense than attack, unmistakable by the low, deep tone of its barking, which can be heard a long way off. Because of its powerful fangs, its courage, speed, it is often used in packs for game, wild boar and other large-game hunting. This is a corpulent, sober dog, a dog of peaceful demeanor. (maximum limits may be slightly surpassed, provided that proportions and functions are respected). Hip dysplasia may occur, but is not very common. The Rafeiro do Alentejo is not recommended for apartment life. It is relatively inactive indoors and will do best with at least a large yard. This breed is very suspicious of strangers, and it is therefore necessary to provide a secure, fenced yard. When fully mature, this breed has an average to low need for exercise. If not actively working, it needs to be taken on a daily walk or jog. This breed requires little grooming. The coat needs thorough brushing-out during the twice yearly shedding seasons. You can get away with little attention the rest of the year. The Rafeiro do Alentejo is a seasonal, heavy shedder. 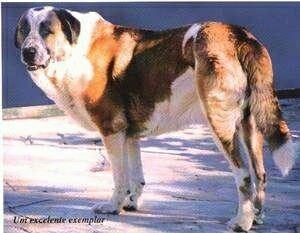 The Rafeiro do Alentejo is often claimed to be descended from huge dogs on the vast Tibetan highlands, thousands of years ago. 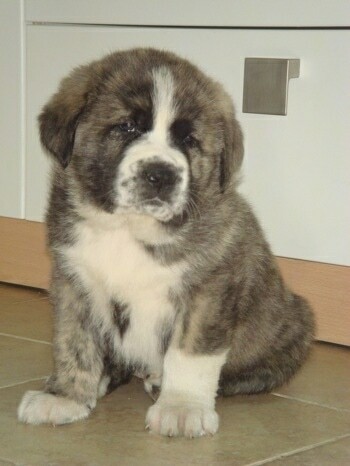 These powerful mastiffs are commonly said to have migrated slowly westwards into Asia Minor. They are thought to have crossed the Balkans, following the Roman legions from the Black Sea to the shores of the Atlantic. Over so vast an area and through centuries of natural selection, they acquired characteristics of their own; this eventually differentiated them from region to region. In the Iberian Peninsula, tribes whose subsistence was based on the exploitation of cattle undoubtedly gave these dogs of great strength and size the unique task of protecting them against rival tribes and cattle rustlers. 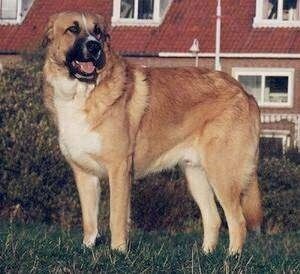 One could say that the Rafeiro, regarding its origin, looks, character and function is between the Anatolian Shepherd Dog and the Spanish Mastiff (the perfect dog). In Portugal, with the geographic and climatic differences between north and south, the need soon arose of moving the cattle annually in search of better pastures. 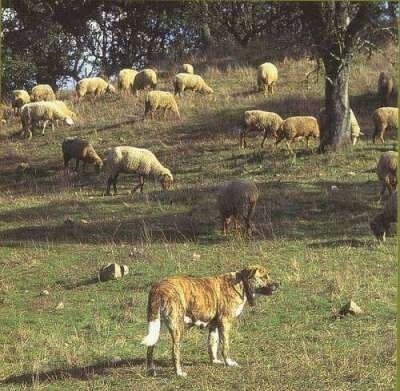 Consequently, for centuries, huge herds, accompanied by powerful mastiffs, were driven between the northern region of Douro and the Alentejo hinterland. As the population settled down, the dogs eventually remained in the southern prairies, where they adapted and began to be used to guard, not only the herds, but especially, in time, the big rural estates. However, it was not before 1953 that, thanks to a census carried out at the end of the 1940s by two distinguished sinologists (António Cabral and Filipe Romeiras), the official standard of the Rafeiro of Alentejo was established. 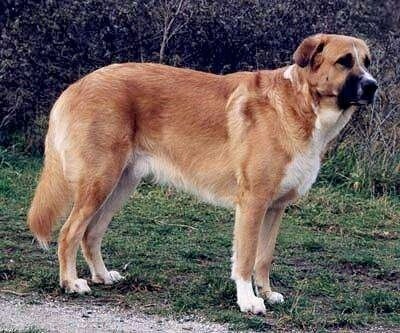 In the ’60s and ’70s this breed declined dramatically, both in quality and quantity, with the most critical point being reached in the early ’80s. It is, however, with great satisfaction that we can say that at the turn of the century this situation has been overcome, thanks to the zeal of a small but resolute group of breeders, who, with dedication and perseverance, are carrying out the rewarding task of ensuring the continuity of the Rafeiro do Alentejo. Today, even though the work must continue unabated, we can say that this precious heritage will be bestowed on future generations. 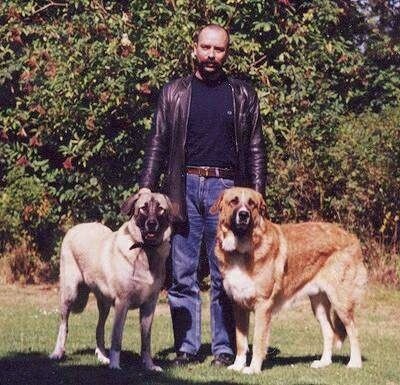 Many thanks to Fernando Julião for providing Dog Breed Info with this information. Before you buy, contact Fernando Julião, who is an official foreign affairs agent of the Portuguese ACRA (Associação de Criadores do Rafeiro do Alentjo) for help and more information.